Halls Greenhouses - Who Has The Best Halls greenhouses? Halls greenhouses are among the most popular greenhouses in the UK today, and it’s easy to see why. They use durable and yet lightweight materials that create an excellent all year round growing environment for plants and seedlings, and yet they offer excellent value for money to the consumer as well. 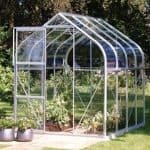 If you’re thinking of buying an aluminium greenhouse, then this could be the ideal brand for you. To help you find your perfect greenhouse, WhatShed have created this handy guide to the very best Halls greenhouses that can be bought online in the UK right now. Halls greenhouses come in many different sizes and styles, but we wanted our league table to reflect the diversity available in the range. We were happy, therefore, to be able to create a top ten league table featuring ten unique models that all have something special to offer: whether it be value for money, durability, good looks, or a combination of all three. When reviewing Halls greenhouses we invariably find them to be well made, as well as offering very good value for money, but even so they’re not as widely available from the leading online retailers as Palram greenhouses for example. That’s why some of our top ten retailers, such as Garden Buildings Direct, are absent from this list. We also wanted to ensure that we showcased the diversity of the Halls range, which is why we’ve tried to include different models and colour schemes rather than simply including different sizes of one or two particular models. Nevertheless, we’re pleased to have found some great greenhouses for our league table. 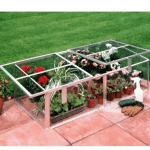 Selecting the table topper was no easy task, so it’s well done to the Popular 106 model which thanks to its exceptional value for a ten foot by six foot greenhouse is named the very best of the Halls greenhouses that can be bought online in the UK today. 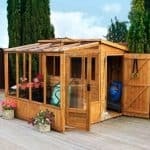 Whether you’re in search of greenhouses, garden sheds, summer houses or workshops, WhatShed bring you the independent reviews that can hold the answers to all your garden building questions. One of the great things about Halls greenhouses is that they are designed with affordability in mind, meaning that more people than ever before can enjoy the benefits of having a well built greenhouse from a reputable manufacturer they can trust. Their Popular range is the epitome of this ideal, as shown in this ten foot by six foot model. It’s one of the largest greenhouses in this league table, making it ideal for keen gardeners who want to upgrade their growing capacity. Despite its generous dimensions, this silver model comes with an asking price of less than three hundred and fifty pounds. 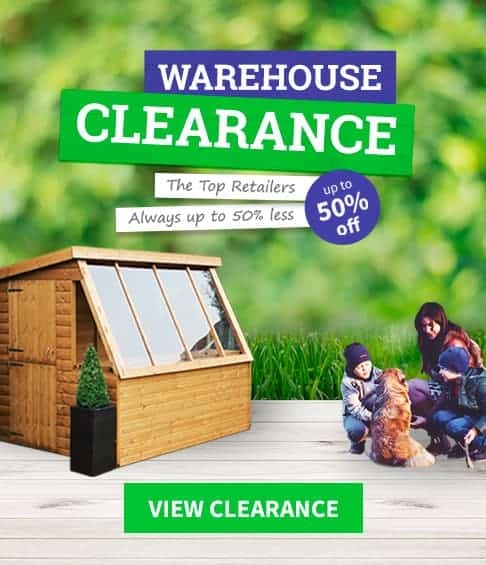 That makes this one of the best value greenhouses we’ve seen from any manufacturer, which is why it finds itself in the top spot of our league table. It’s not just the great value asking price that impressed us about these Halls greenhouses. Horticultural glass is included as standard, which has excellent light and heat transference properties for the plants within, but we were pleased to find that this could be upgraded to either polycarbonate or toughened glass if desired. We were also impressed by the inclusion of integrated gutters as standard, as this allows the owner to collect rainwater and recycle it for use in watering their plants and lawn. It’s a greener solution for garden maintenance. Halls greenhouses provide an excellent environment in which to nurture plants, providing protection from cold and wet weather, while at the same time providing the heat and light that plants and seedlings need. 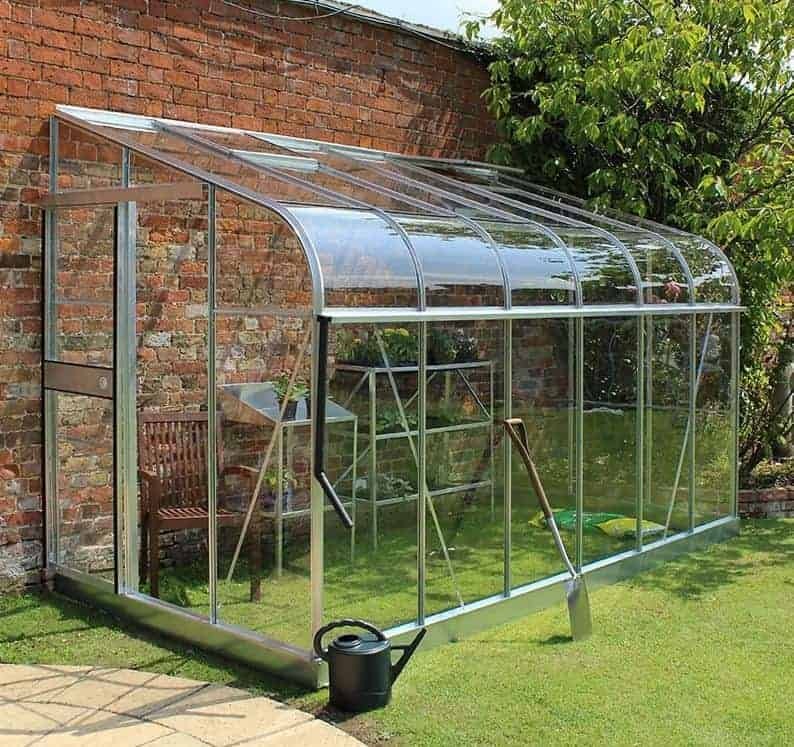 Not everyone has the lawn space, however, for a traditional greenhouse, and for such people this silver coloured Europa 84 model could be the ideal solution. Its base area of approximately eight foot by four foot is given a lean to design, meaning that it’s designed to be situated against a house or garden wall. That makes it an ideal purchase for gardeners who don’t want to use up their precious lawn space, and with a very low price of less than three hundred pounds as well we have no hesitation in awarding it the runner up spot in our league table. Style wise it’s not among the most exciting Halls greenhouses that we’ve seen, with the tough aluminium frame bearing its natural colour and arranged in straight lines, but this means that its the plants within it take centre stage. We were pleased to imagine how easy it will likely be to get in and out of what is a relatively compact lean to greenhouse as well, making plant maintenance quick and straight forward, and it was good to see a centrally positioned vent included as well. 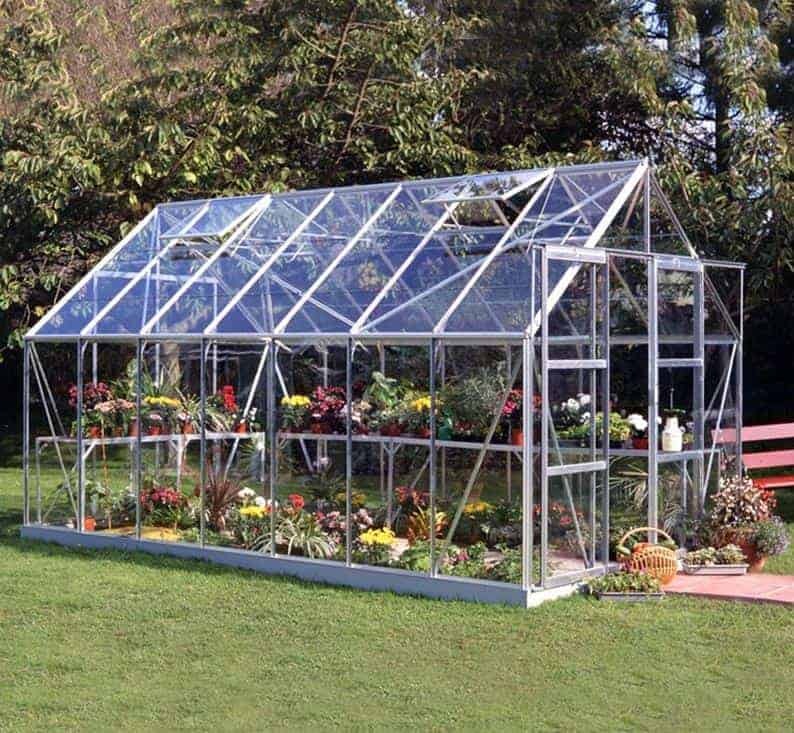 This is a no nonsense greenhouse, but we can imagine it appealing to people who are looking to take their first steps into greenhouse growing. 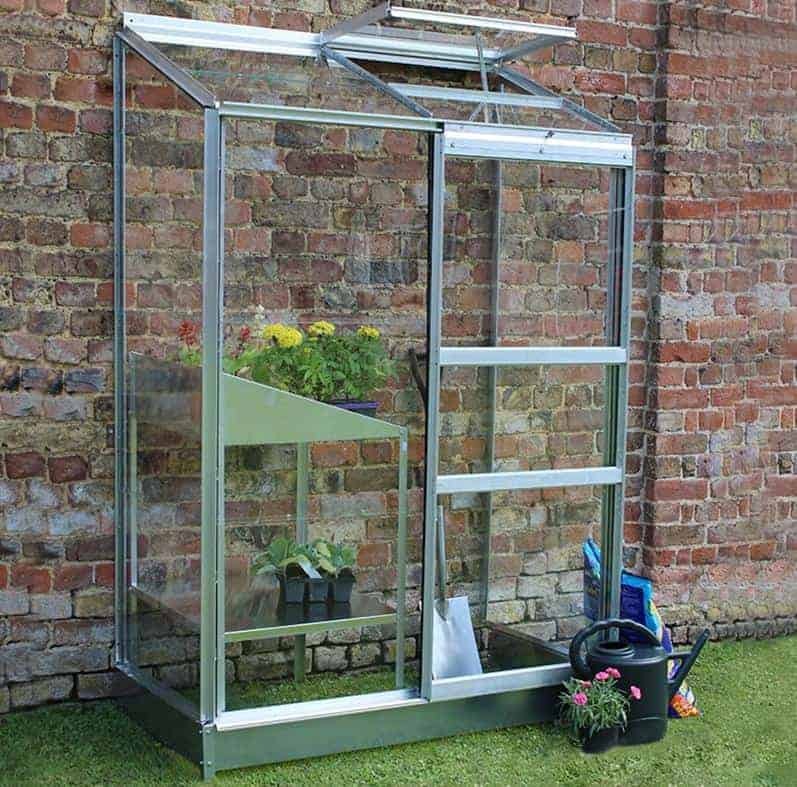 Just because a person opts for a lean to greenhouse doesn’t necessarily mean that they have to compromise on the growing space available, as this Silverline 126 model from Halls greenhouses demonstrates. Its base area of 3.85 x 1.91m makes this by far the largest lean to that earns a place in our league table, making it suitable for a wide variety if plants and yet still leaving the lawn space free. It also means that there’s a lot of room to move around in, and that’s helped by a peak height of 2.34m, which is much taller than we usually see on the aluminium greenhouses we review. For that reason, we can even imagine this being used as a relaxing sunroom, with the addition of some appropriate furniture. We were pleased to find two roof vents included as standard on these Halls greenhouses, meaning that every corner of the interior should be cooled down on hot days. We were also impressed by the curved eaves, which we found very attractive to the eye, and which give this the look of a much more expensive greenhouse than it actually is. If you want a large greenhouse, but don’t have a large amount of lawn space on which to situate it, then this is certainly worth looking at. This particular model can’t compare with the other Halls greenhouses in our league table when it comes to size or growing capacity, and it’s not an environment that you can walk around in or even sit and relax in like some of the other greenhouses to feature here. What it is, however, is a well built mini greenhouse for people who grow plants on a small scale yet still want to be able to nurture them all year round. 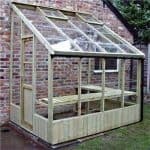 It’s also highly affordable at less than two hundred pounds, making it the cheapest greenhouse to earn a place in this WhatShed league table. The lean to design of these Halls greenhouses is especially useful with such a compact design, as it gives it the stability and strength that it could otherwise lack. One advantage of its four foot by two foot base area, however, is that it should be both quick and simple to assemble, and we were pleased to find that a base rail is included as standard, rather than being an optional extra as we often see on aluminium framed greenhouses. It means that the greenhouse can easily be installed onto a flat concrete surface, or alternatively a patio or even a level balcony, and this adds even more value. This is the largest of all the Halls greenhouses to feature in this top ten league table, with a base area of 4.45 x 2.57 and a ridge height at the summit of the apex roof of 2.39m. This makes it ideal for keen amateur gardeners who want to take their plant growing to a new level, and even for those who grow things on a semi-professional level. For such a high quality greenhouse of this size we’d normally expect to see an asking price of upwards of a thousand pounds, so we were very impressed to find that this Magnum 148 model is available for less than nine hundred pounds; it’s this that earns it a place in the top half our of our Halls greenhouse league table. Such a spacious interior needs a lot of ventilation to ensure that optimal growing conditions are achieved, so we were pleased to find that there are four ventilation panels in the roof of these Halls greenhouses. We were also impressed at the number of optional extras available, allowing the owner to customise their greenhouse to just how they want it. The horticultural glass can be upgraded to toughened safety glass for instance, and it’s also possible to add auto-openers for the louvre and for the vents. These add to the asking price a little, of course, but as it’s so reasonably priced to start with we don’t see that as being too much of a problem. This is among the most eye catching Halls greenhouses we’ve reviewed for two reasons: firstly it has a very attractive dark green colour scheme as opposed to the silver colour adopted by the models above it in our league table, and secondly it has curved eaves that give the greenhouse as a whole a teardrop shape. We were very impressed by the quality of the powder coated finish, and it also gives an extra layer of protection against the elements. On the downside it also means that it carries a relatively higher price tag than standard silver models from Halls, but it still represents very good value for money. If a stylish appearance is something that you prize highly in a greenhouse, then this is one that you’ll want to have near the top of your shortlist. 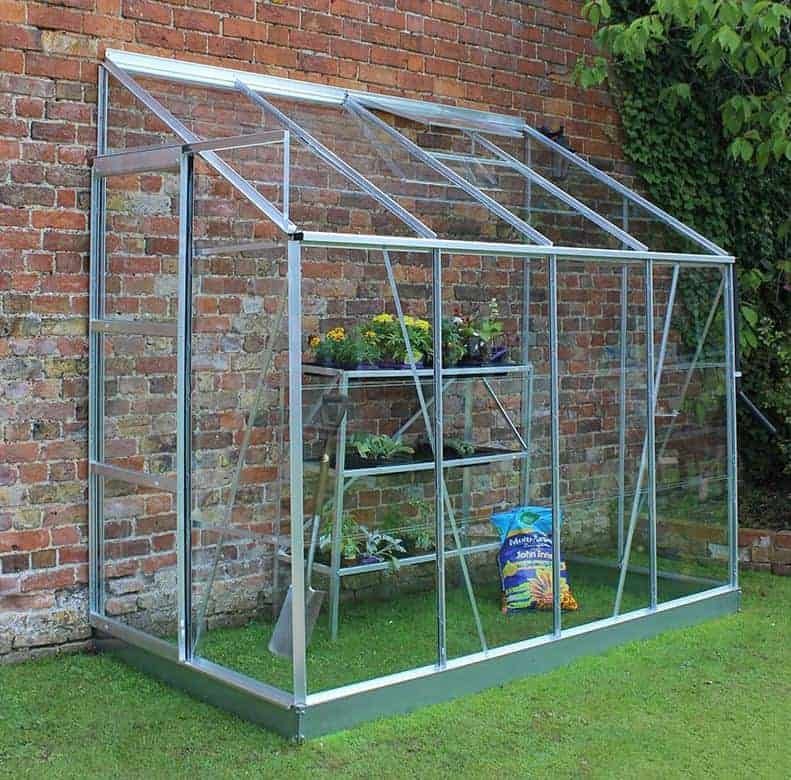 The eight foot by six foot base area makes these particular Halls greenhouses ideal for smaller gardens, in our opinion, as it won’t take away too much space from the lawn itself and yet there’s still lots of room for plants inside as well, especially if shelving is added. Once again, there’s also the option to add toughened safety glass, which is a feature that we always welcome, even though it will add a little over two hundred pounds to the asking price. 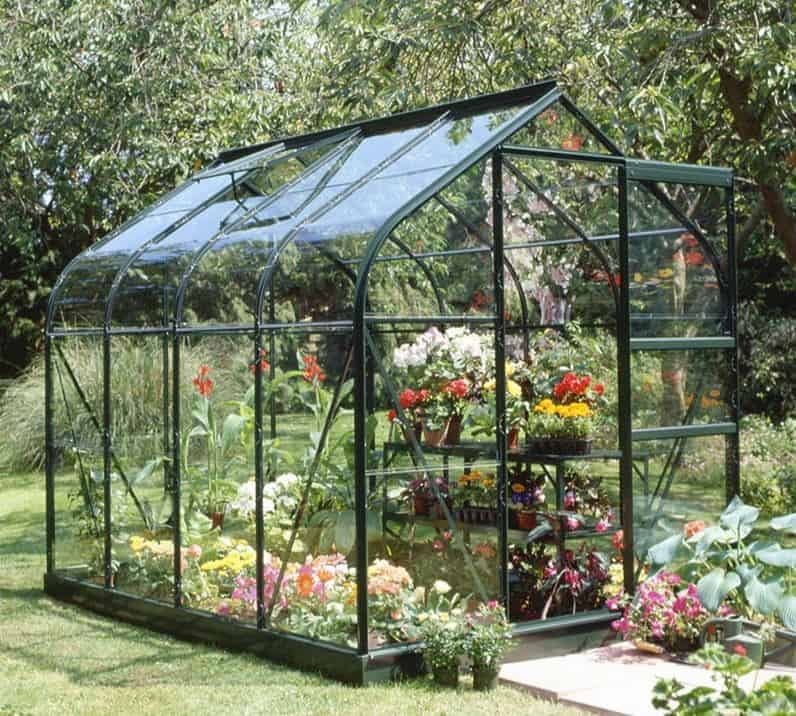 This is by far the most expensive of the Halls greenhouses to make it into our top ten league table, at approximately thirteen hundred pounds for a base area of ten foot by eight foot. This has been taken into account when determining its position within the list, but it also has a highly useful unique feature, in that it comes with toughened safety glass as standard. It’s completely clear, and has excellent light transmitting qualities, thus creating an optimal indoor environment for plants to thrive in. It’s also virtually shatter proof, which makes it a much more secure environment, and of course it’s good news for those who are likely to have young children playing around their greenhouse. If it wasn’t for the price tag which may put it beyond the budget of some, then we would have awarded this a much more elevated position. We found the green colour scheme very aesthetically pleasing from the moment we saw it, and it should also blend in very well with a traditional garden background. We also liked the wide opening double doors, making it easy to transport trays of plants inside or even to push a wheelbarrow in and out. 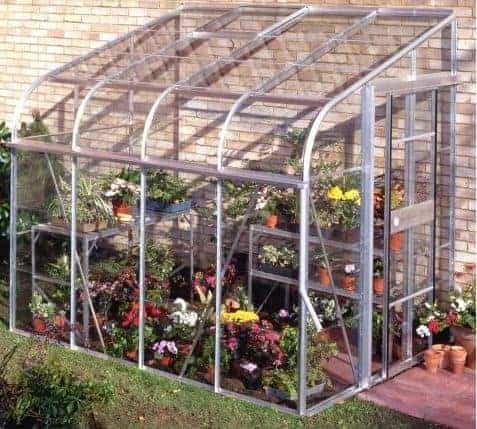 Another unique feature attached to this Halls greenhouse was a ten year guarantee on the frame, and although the glass is excluded there’s little need to worry about its durability. 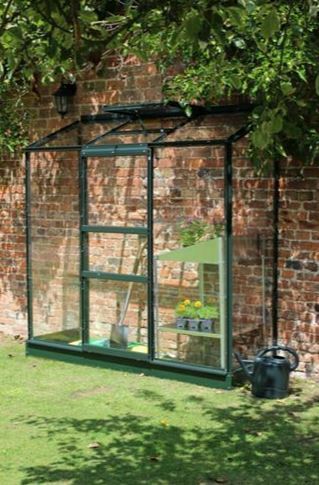 These four foot by six foot greenhouses make a stylish addition to the garden, thanks to their colour scheme, reminiscent of a British racing green, that has been applied to the tough and weather resistant aluminium frame. 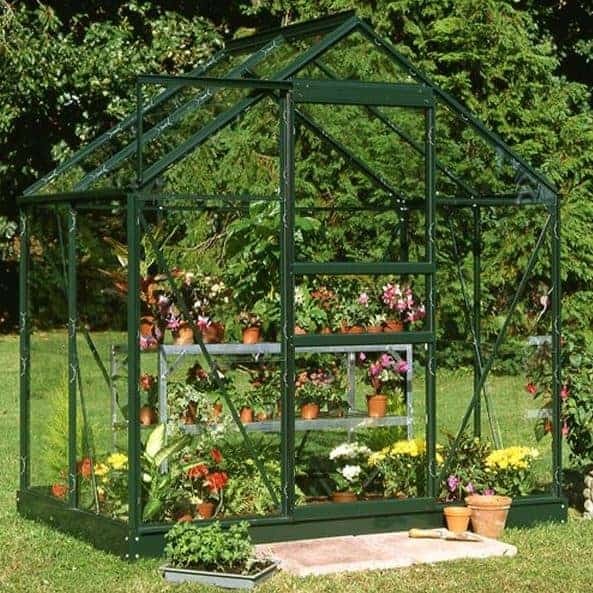 For that reason we think they would be ideal for people who want the advantages that metal framed greenhouses bring, primarily that they won’t rot, don’t require painting or staining, and don’t have to be treated with wood preserver, yet don’t want anything that looks too obviously metallic in their garden. We were also impressed by the 10 year guarantee supplied with the frame, which is a good indication of just how tough and weather resistant these Halls greenhouses are. Once more, we were pleased to find that guttering is included as standard, which isn’t always the case when we review greenhouses that are as affordable as this one. It was also good to see that either polycarbonate or toughened glazing could be added as an optional extra, in place of the horticultural glass which is ordinarily supplied. A steel base is another highly useful option that we would recommend, as it adds strength and stability to the structure as a whole, as well as making it very easy to install upon a level area of concrete. 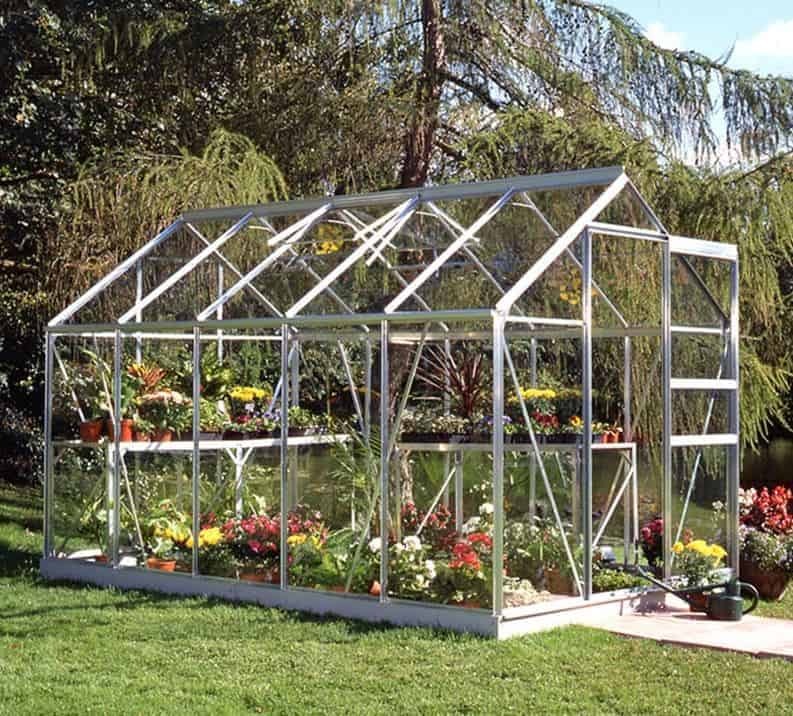 This is a mid sized model from the Silverline range of Halls greenhouses, but we feel that the interior storage area of around five metres squared will be more than adequate for most amateur gardeners who want to supplement a small to medium sized gardens. Its height of 2.35m means that there’s lots of room for stand alone shelving to be added as well, which is why we can imagine this being used to grow pot plants and trays of seedlings. These Halls greenhouses have a lean to design that is both practical and attractive. Even though a natural silver colour scheme has been adopted here, we still found it pleasing on the eye thanks to the use of curved eaves. We were also pleased to find that a gutter had been fitted along the full length of the greenhouse, which makes this a smart choice for greenhouse owners who are concerned with keeping their carbon footprint down and utilising a greener way to water the garden. 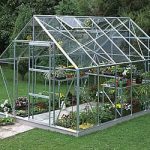 We found a lot to like in this lean to greenhouse, and it’s only the higher than average price tag attached to it when compared to some of its stable mates that sees it take a position towards the foot of our league table. This is the only wall garden in our league table to feature the green powder coated colour scheme that we and so many others find attractive. That means that it creates a striking contrast with the wall that it’s placed again, and it should fit in particularly well with walls that have climbing plants such as ivy growing upon them. Whilst these compact Halls greenhouses have a depth of just 0.69m, they have a width of 1.94m, so you can likely fit a lot more plants inside than you might initially think. 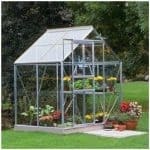 It also means that more of the plants are evident at first sight, which is why we feel this is a smart choice for people who want a small greenhouse that will also act as a garden display cabinet for flowers. 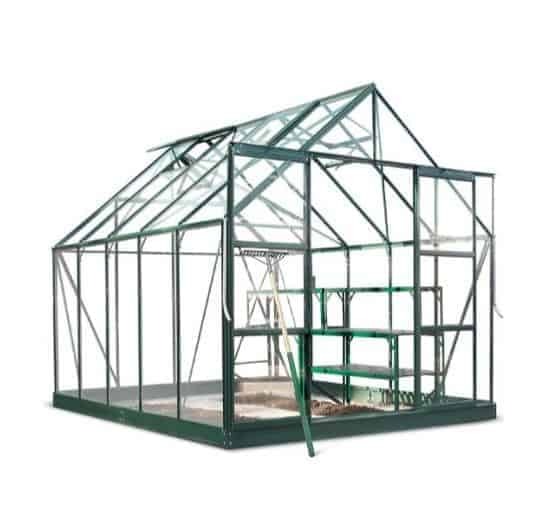 We were pleased to find that a strong steel base is included as standard with these Halls greenhouses, and this should make the assembly process straightforward and speedy, with the horticultural glass panels simply slotting into place. We were also impressed by the opening window in the centre of the pent roof, as this can be propped open to supply a steady floor of cooling air that plants will need on hotter days. If the price tag was a little lower, then this could have been looking at a position towards the top half of our WhatShed league table.